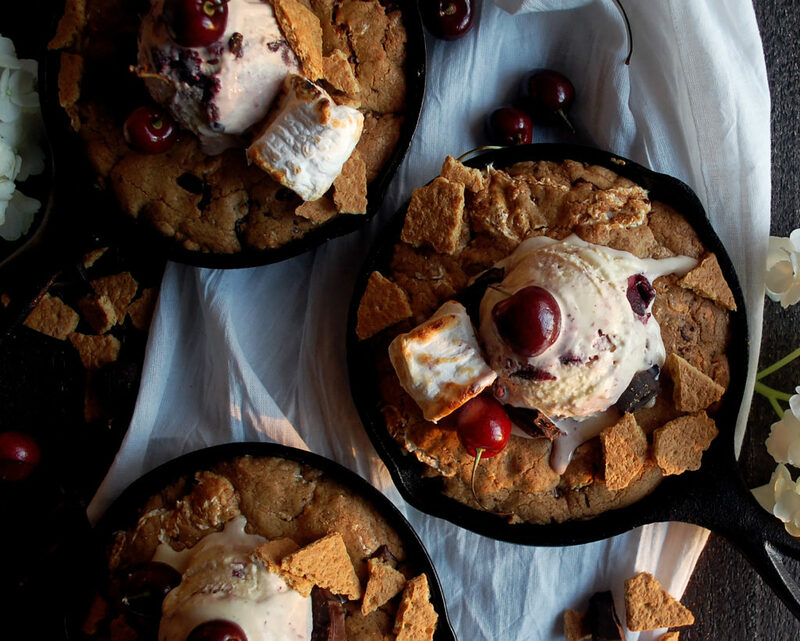 With summer coming to an end, I’d say we eat a s’mores cookie skillet as often as we can! I just absolutely love s’mores. It’s such a simple combination that evokes such a strong emotional connection to childhood memories. Sitting around a campfire, opening the box of graham crackers, and fighting over the last piece of chocolate. Not to mention waiting patiently for that perfectly toasted marshmallow, while accidentally lighting a few on fire in the process, of course. 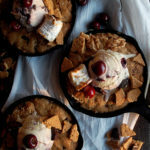 These traditions are what summers are made of, so I am all in for anything s’mores…especially when it comes to these cookie skillets. Think really soft, chewy cookie dough with the sweet graham cracker flavor, gooey dark chocolate chunks throughout, and a swirl of toasted marshmallows…yes, please. You’ll absolutely love all of these s’mores flavors in cookie form, and what’s even better is the skillet! Cookie dough baked into a skillet creates a really thick, chewy cookie that you get to use a spoon to scoop out and devour. Top it with this Homemade Red Wine Cherry Ice Cream and you’re set for the summer! Enjoy! Preheat the oven to 375F. In a mixing bowl, whisk together the flour, baking powder, baking soda, and salt. Set aside. In a stand mixer with a paddle attachment, beat the butter and both sugars until smooth. Mix in the eggs one at a time, scraping down the sides when needed. Add the vanilla extract, mixing just to incorporate. Gradually blend in the dry ingredient mixture, scraping down the sides, until fully incorporated. Add the chocolate chunks, graham cracker crumbs, and toasted marshmallows at the end. Give a quick mix until the ingredients are distributed throughout the dough. Prepare 3 (6.5”) cast-iron skillets by greasing them with butter. Divide the dough evenly into the skillets, pressing down so the dough is flat and covers the entire surface. Transfer the skillets to the refrigerator and chill the dough for 30 minutes. Bake the cookies for about 25 minutes until golden brown. You want the cookies to still be soft and chewy on the inside. Be careful not to overcook. 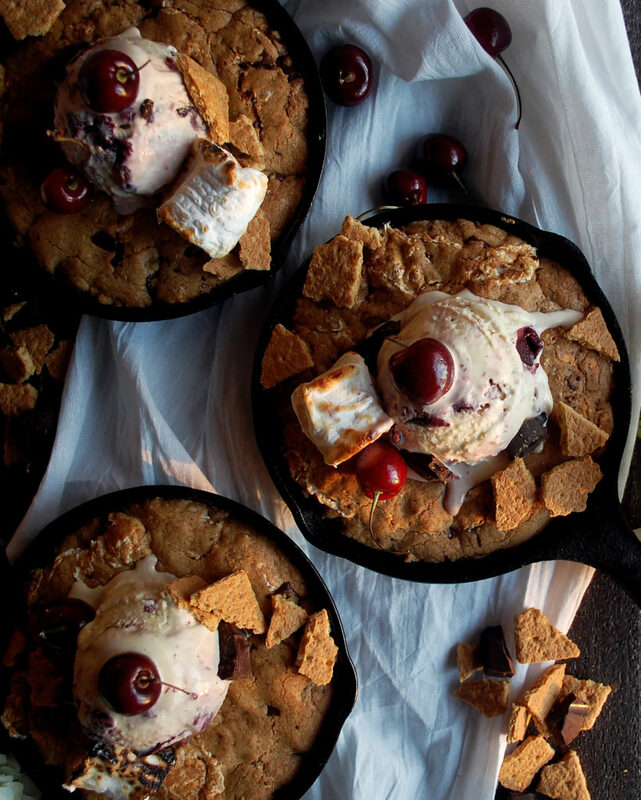 Serve the skillet cookies with a scoop of cherry ice cream. You can serve this with any ice cream flavor you’d like!